Tartelette: Wishing You The Sweetest Of Holidays! In the midst of all the Christmas preparations in our kitchen and I am sure in yours, I wanted to take the time to wish you a very Merry Christmas and plenty of joy and happiness this holiday season. In my family we celebrate Christmas Eve and Christmas Day with two big dinners. In B's family, it's only Christmas Day. His is small-ish, mine is big. Huge actually. Nowadays, we are doing a bit of both even if I am not home and he indulges me in some of my traditions, like the Provencal 13 desserts and listening to "La Pastorale des Santons de Provence". Yes, baby Jesus was born in Provence and his parents spoke with the accent. You didn't know?! No Christmas is complete without it and in the 30 something years I have been around, I have had plenty of time to learn each character by heart. Until my grandmother passed away, Christmas Eve dinner was held at my grandparents' house after church and we would go *all* out. Christmas Day's traditions were a bit more low key as it was the "in-laws" day, meaning my uncles and ant would go visit their in laws during the day and come back for dinner. Those who were without in-laws would make their way to my parents' house for lunch for macaroni, butter, parmesan and a plate of charcuterie. Came 8pm and we would have a Christmas Day dinner usually revolving around a buffet of regional delicacies. One of our holiday traditions is to make a visit to our favorite chocolatiers, "Les Chocolats Colas" in the town of Maule. True chocolate artists making the most intricate as well as delicious chocolate creations. We usually get a few pieces to take home but we really go there for their chocolat chaud. More like ganache chaude really. Indeed, the chocolate is so rich and so thick that it is served in small espresso cups. Trust me, that is plenty. Strong, spiced just right and silky all the way down to your toes. As part of my holiday rituals of listening to La Pastorale while baking, I always make sure to fix us a batch of hot chocolate albeit a little lighter than the one we have at the Colas chocolate shop when we go home. B. likes to have a handful of marshmallows in his hot chocolate but I really find store bought ones to be tasteless and gritty. Ok, so they can be gooey mess, marshmallows are so easy to make at home, it's worth it trying them at least once. Both recipes for our favorite creamy and rich hot chocolate and homemade marshmallows after the bump. Tonight's dinner will be with some of our closest friends around some French regional delicacies. Low key, reflective and quiet. Just what I like. Thank you for your readership throughout the years. You cry and laugh with me and everytime I come here and spill some goodies, I feel like having coffee with some good friends. Thank you! Place the chocolate in a large bowl. Set aside. In a large saucepan set over medium heat, bring the milk and cream to a simmer. Remove from the heat and slowly pour the hot liquid over the chocolate. Let the mixture stand for 2 minutes then slowly whisk the mixture until completely smooth. add the spices, stir and serve with the marshmallows. Line a 8X8 baking pan with plastic wrap. Spray lightly with cooking spray and sprinkle lightly with some cornstarch, shake the excess off. In a medium saucepan, combine the water, corn syrup, and sugar, bring to a boil until “soft-ball” stage, or 235 degrees on a candy thermometer. Sprinkle the gelatin over the cold water and let dissolve. Remove the syrup from the heat, add the gelatin, and mix. Whip the whites until soft peaks form and pour the syrup into the whites. Add the vanilla seeds and continue whipping until stiff. Pour the mixture into the prepared pan and let set 24 hours at room temperature. Unmold and cut squares with a hot knife. I love hearing your stories from France. And mixed with a little bit of the low country I'm sure your kitchen is the place to be right now. 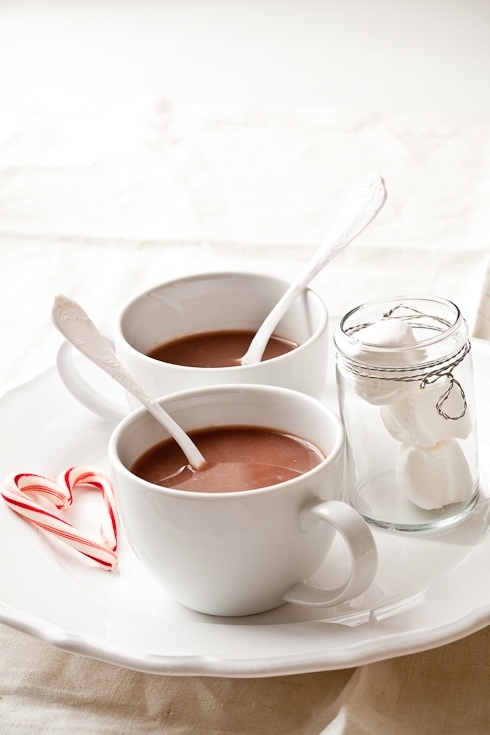 Was looking earlier this week for a good hot chocolate recipe and this one looks perfect. Thank you for all the recipes, photographs and love you put into this Helen! This looks heavenly! Merry Christmas =D. So lovely to hear about your family's traditions. Thanks so much for sharing them. Our eldest has just been introduced to the wonder that is hot chocolate, and it's just about his favourite thing. This spiced version would just send him over the moon. Merry Christmas, Helen! I look forward to seeing all your sweet inspirations in the New Year. Happy holidays, Helen! And thanks for wonderful recipes. loved reading about your holiday traditions, and as always the pictures are beautiful, calming in a way. Merry Christmas! Happy Holiday and all the best for the New Year! provencal 13 desserts? can i come over, please? pretty please? after spending time touring provence last year, i'm smitten beyond belief. joyeux noel!! No dahling, I thank you and the beautiful big heart that you share. Your captivating nature lends itself to ease and all around light heartedness! Merry Christmas, Helene & family!! I love your photos, and I love how the peppermint canes form a heart. The hot chocolate sounds delicious. You never get too old for hot chocolate and marshmallows. Happy, happy holidays to your family. Thanks for sharing this, Helene!! Love the marshmallow recipe! Merry Xmas Helen! All the best for festive season and 2010. Merry Christmas and thank you for all the wonderful recipes. Joyeux Noël à toi et à B., et très bonne année sucrée et pleine de bonheur! Je suis sûre qu'elle le sera. merry christmas, helen! you bring us all much joy (and deliciousness)! Merry Christmas to you and your family. Best wishes for the new year. Merry Christmas! I'm so glad you and your husband had a wonderful holiday together. Wonderful family traditions! Happy Holidays to you and your family--best wishes for 2010! I made some marshmallows this week too and agree homemade is way better. Merry Christmas, Helen! Wishing you a happy, healthy and prosperous 2010! Homemade hot chocolate with homemade marshmallows sounds like a wonderful tradition to me. Have a wonderful holiday, full of love and family. Happy Holidays to you Helen, and many many thanks for guiding me through the macaron process. I sat down on Christmas eve and had a lovely cup of tea and a vanilla macaron with raspberry cream filling. Sweet succes! Merry Christmas to you and your family. Happy New Year too. I have very much enjoyed your blog for the past couple years. I am always a little envious when people get to know you. I wish I could, you sound so lovely. You make me want to go to France right now! I hope you had a wonderful and blessed holiday. Thanks for being such a nice food-blogger pal! Merry Christmas to you and your family, Helen! Winter Holidays as beautiful and quiet, which will fill the soul with joy, confidence, hope and love! Vanilla marshmallows sound fabulous. Love visiting your site Helen, for all the honesty and beauty I know I will find here. Happy holidays and best wishes for the New Year. ah ça tombe bien, I've been looking for a nice hot choc recipe...I didn't even know marshmallows could be made from scratch! Beautiful! I have always wanted to make homemade marshmallows. Do you make pompe a l'huile for your 13 desserts? I've come across such varying recipes, some of which seem little different from bread dough. What's your recipe like, if you don't mind my asking? Thanks for the recipes. Great marshmallows! Hiyam: Yes I make pompe l'huile for our 13 desserts. Since the 13 desserts are supposed to symbolize Jesus and his apostles, the pompe a l'huile is often said to symbolize the bread that Jesus shared with them during the Last Supper. It is a slightly sweet bread, not a cake, so yes, it is customary to start with a bread dough base. Happy holidays to you Helen! That picture is fantastic, so very well composed and full of whimsy. I hope you had a lovely Christmas with your family and/or friends. This sounds as scrumptious as it looks! i love family holiday traditions. i loved the pastorales in the french basque country we used to go watch as a kid. that photo makes me feel warm and cozy inside. happy holidays and wishing you the best 2010! Hi! 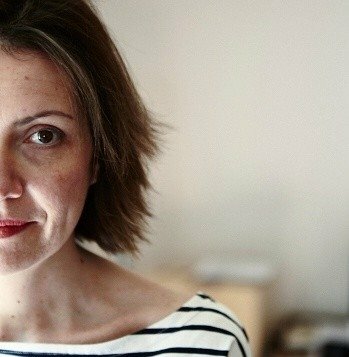 I just discovered this blog via decor8 and have fallen in love with it! I was wondering where you got the fancy white spoons in the cups of chocolat chaud -- they're lovely. Made these last night and they are fantastic. I substituted vanilla paste for bean (that's what I had in the pantry)and whipped for about 12 mins as I had seen in other recipes- this one doesn't stipulate. My only disappointment is not making a double batch, I can tell they will disappear very quickly. I have read elsewhere to leave them out after cutting an hour or so before transferring into container to help prevent them going moist/sticky again.